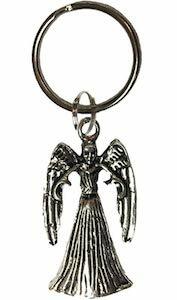 If you want a key chain that prevents you from blinking then you have to check out this Weeping Angel key chain. The Doctor Who key chain has a nice round key loop and on it you will find a pendant of a Weeping Angel and it really seems to be ready to get you or maybe it is just protecting your keys. The Weeping Angel on the key chain is 1 3/4 inch long and will look stunning next to your keys as it has kind of the same color. 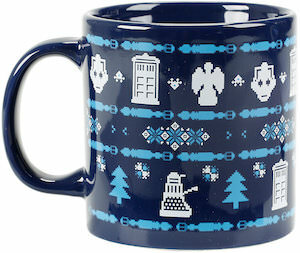 No more loose keys for you because this Doctor Who villain has you covered. 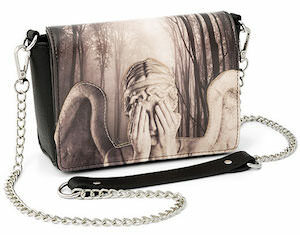 If you like Doctor Who and want a cool purse then this Weeping Angel handbag is what you want. The cross body bag has a print of a Weeping Angel on it and it is covering it’s eyes but when you open the flap you will find a completely different Weeping Angel and you can see it by clicking on the image. Inside the Doctor Who purse you can find a zipper pocket for your valuables and a bigger pocket for things like your phone and the main flap closes with a magnet so it is easy to use and keeps you stuff in place. If you like cooking and Doctor Who then you should check out this Weeping Angel cutting board. 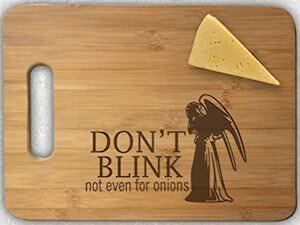 The cutting board is made from wood and has a Weeping Angel on it and next to the angel it says “Don’t blink not even for onions”. And this Doctor Who cutting board is 9 x 12 inches and has a handle so that you can easily hold it or maybe even hang it when not in use. The print on the cutting board is engraved in it so that it should be there for as long as you are using the cutting board. Time to cut some food so that it is ready when you are hungry. If you like Doctor Who and cakes then this cake pan is what you need. The silicon pan has room to make 6 cakes at once and each of them has a typical Doctor Who item on it. 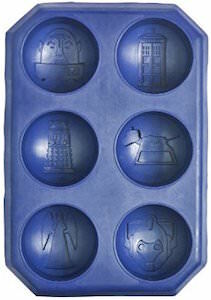 You will find Sontaran, Tardis, Dalek, K-9, Weeping Angel, and Cyberman in this cake pan and that gives plenty of cool designs for your next high tea or just as a fun desert. No more need for boring cupcakes or plain cakes because the Doctor will help you create fun cakes that bring back memories to all those adventures Doctor Who has. 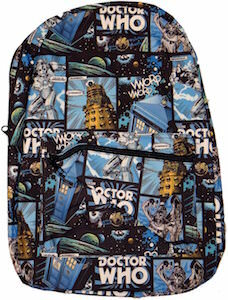 This Doctor Who backpack is all about the Tardis and the villains we all know and it shows all that in a comic style. The Doctor Who backpack has panels just like a comic book and in those panels you can find many of the characters like the Tardis, Dalek, Cybermen and Weeping Angel. A backpack like this is just perfect for a true Doctor Who fan and is great for everyday use or even for back to school because we all have stuff to carry around and a backpack from Doctor Who is a great way to carry it all. Doctor Who leggings can be hard to find but when you find the perfect pair you will know. And now there is this pair of Doctor Who leggings that looks like a Doctor Who comic book with many important details like of course the Tardis, Dalek, Cyberman and Weeping Angel and it even has the Doctor Who logo on it and yes that makes for a pair of busy looking leggings but that also makes them extra amazing. These leggings have an elastic waist and just look stunning and are easy to wear just like that or with a fun dress, skirt or shorts. 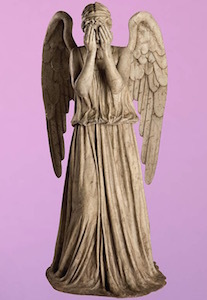 This Weeping Angel wall decal will once more make it clear to you not to blink because you as a Doctor Who fan of course knows what happens when you do. Now you bedroom or living room wall can have a giant Weeping Angel on it and that of course is kinda scary to fans of the Doctor like you. This wall decal is more then 6 feet tall and the angel is blocking it’s eyes but you know it’s still watching you. Beside the big Weeping Angel this Doctor Who wall decal also includes some smaller decals so that you can make you whole room become a Doctor Who paradise. 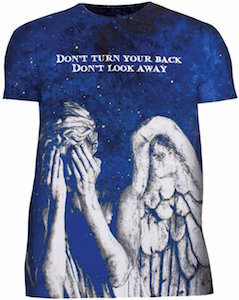 This blue Weeping Angel t-shirt is just what a Doctor Who fan needs and that is why you should take a closer look. This shirt is great as casual wear or maybe even a sleep shirt and on there shirt you can see the galaxy in the background and in front of that a giant picture of a Weeping Angel that is covering it’s eyes. Above the angel it says “Don’t turn your back Don’t look away” and it’s seems they forgot to mention not to blink. You can get this special Doctor Who t-shirt in unisex sizes Small – 2XL so that both men and women can enjoy this special t-shirt. And when you buy this Doctor Who t-shirt you will find out that it is made from 100% cotton.